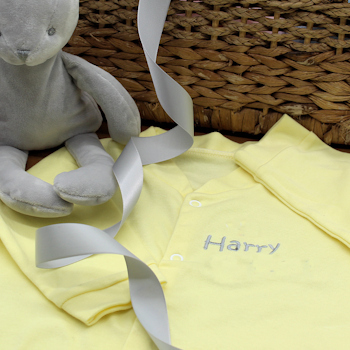 Personalised pastel yellow long sleeve cotton sleepsuit that is made in the UK. Custom embroidered with a name or initials of your choice, and in your favourite thread colour too! This yellow cotton sleepsuit is a lovely useful gift for baby. Simply choose the text and letter font style you like the best. We will sew the personalisation in a thread colour of your choice.